With the snow melted and summer on its way, get ready to start seeing scooters everywhere – and get ready for your kids to start asking for scooters of their own. 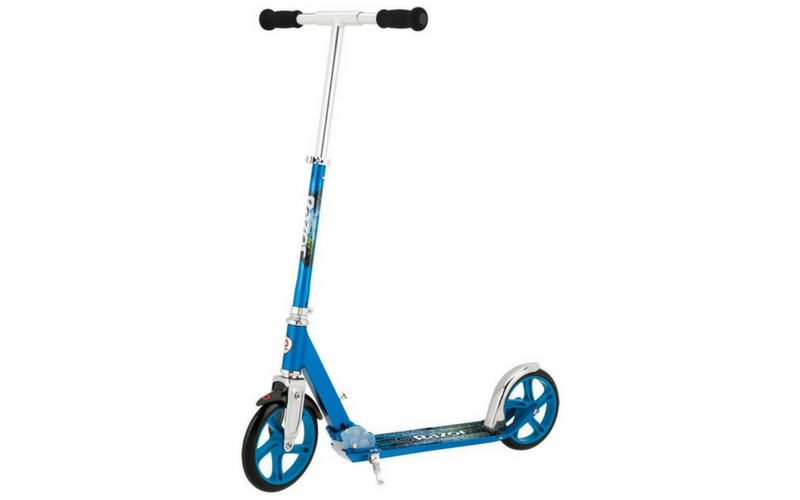 By now, most parents will have heard of the Razor Scooter, but is it really the best scooter for kids? What other options are out there? Never fear. We put together a complete guide to the best kids' scooters that you can buy in Canada – and even found a few you can get on sale! So how did we arrive at this list? We looked carefully at some of the most popular kids' scooters on the market and then checked out their age and weight ratings, safety features and price. Also, we made sure that absolutely every scooter included in this post can actually be bought in Canada – so you don't have to worry about any international shipping surprises. Well, what are you waiting for? Dive in! With all the different scooters out there, how do you decide which one is right for your child? To start, you can try to narrow your selection down by figuring out what type of scooter to look at. Different features are better suited to specific age groups and skill levels, so keep your kiddo's scooting ability in mind as you shop! The big difference here is power: kick scooters are kid-powered (and are pushed forward by kicking off against the ground), whereas electric scooters are battery-powered. Electric scooters, like the classic Razor E100 Electric Glow Scooter, tend to be much heavier and are really only suitable for older kids. 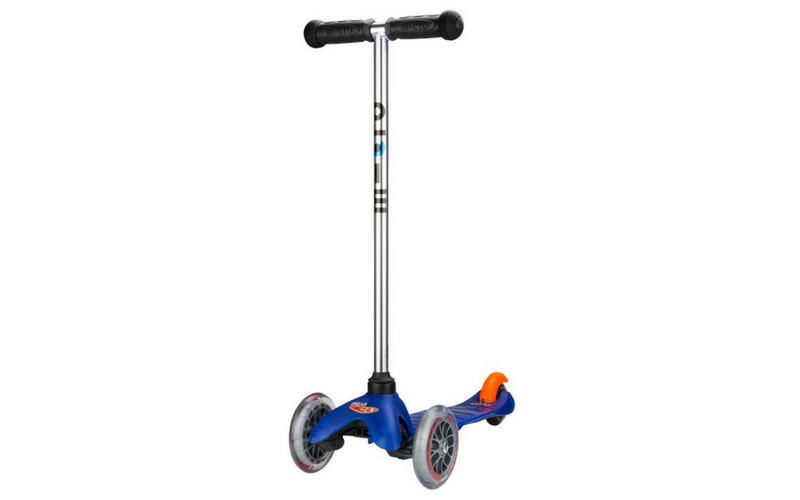 As a result, kick scooters (including the Razor A3 Kick Scooter) are also much cheaper, so they're a great way to get your younger children interested in scooting and have them test things out. Three-wheeled scooters provide more stability than regular two-wheeled kick scooters, so they're better suited for younger kids who might still be learning to balance. Usually, you'll see two wheels in the front and one in the back, as well as a bigger deck (which can help make balancing on a scooter a little easier). One of the better-known three-wheeled scooters is the Micro Mini Kick Scooter, which is made especially for younger kids. These scooters do pretty much exactly what they sound like: instead of using the handlebars to turn and steer, kids just lean in the direction they want to go. This can help make balancing a little easier, especially since many of them (like the Little Tikes Learn to Turn Scooter) are also three-wheelers. Seated scooters can make riding a little easier and more comfortable, since you can just sit back as you coast. Typically, you'll only find seats on electric scooters – like the Razor E300-S – so they're best suited for older kids. You can also add a seat to a Razor E300 with the help of a Razor E300 Electric Scooter Seat Kit. Now these are a little different. Swings scooters – like the Yvolution Y Fliker A1 Kids Scooter – are Y- or V-shaped, three-wheeled scooters where one wheel is at either end of the V. They're sometimes also called Wiggle Kick Scooters – since you need to wiggle to move forward. Before you ask, no, you don't need to be a professional to use a pro scooter. The term refers to a kind of scooter that is used specifically for pro scooting (also known as stunt or trick scooting), which involves jumps, stunts and tricks. 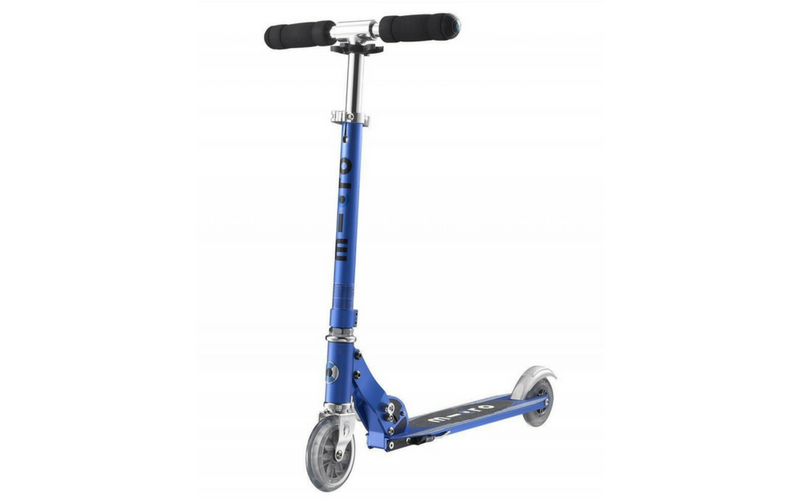 In general, these scooters – including the Envy Series 5 Prodigy – are lightweight and have T-bar handles, so they're easy to maneuver. Like with any toy, there's always a chance that pieces may come loose from a scooter or need to be repaired. Luckily, it's pretty easy to get replacement parts for some of the brand-name scooters, like Razor and Micro. For this reason, you might want to stick with a higher-end scooter or more well-known company, so you have a better chance of being able to find spare parts when you need them. Micro stocks every replacement part for their scooters and kickboards in Canada, so just head to the Parts section of their website to find what you need. This is one of the best scooters for toddlers, hands down. The Micro Mini 3-in-1 Scooter lets kids start scooting while they're still pretty young – and it even grows along with them! If you're familiar with the Micro Mini Scooter, this is essentially an adapted version of that. 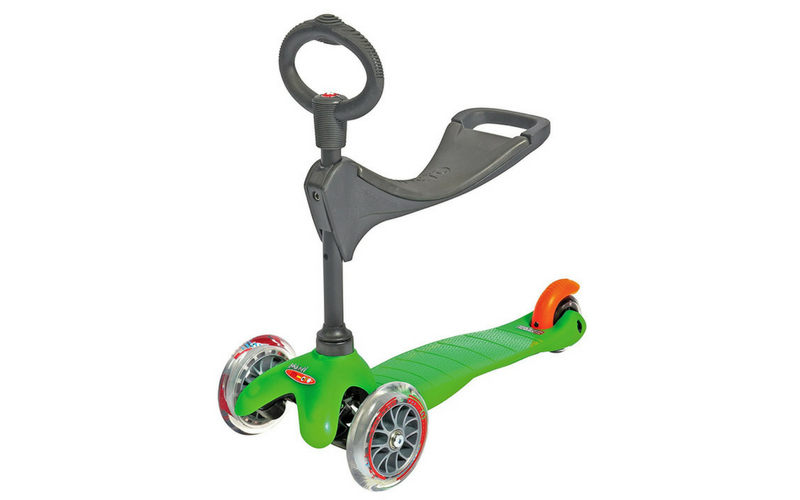 It transitions from a sit-on scooter (with an adjustable seat) to a stand-up toddler scooter (with a chunky, low handlebar) to a Mini Micro Scooter! Pre-schoolers are sometimes stuck in that awkward in-between stage. You want don't want to get them anything too babyish, but they're probably not ready for a true kick scooter yet. That's why the three-wheeled Micro Mini Scooter is perfect. It's designed for kids aged three to five years old, it uses a lean to steer mechanism and has a large, low-to-the-ground deck to make balancing a little easier. Just keep in mind that isn't not built to withstand jumps and tricks, so use it for cruising only. The Micro Sprite Kick Scooter is a clear winner here, simply because of how versatile it is. The scooter comes in a few different colours and is small enough for kids but can still hold up to 220 lbs – which means adults can use it, too! You likely won't need to worry about your child outgrowing this one, since you can adjust the height of the handlebar. While there are some pretty impressive electric scooters on the market, we focused on bargain models. That's what we do here, after all! The Razor Power Core E90 Scooter is affordable for any scooter (let alone a battery-powered one), and it's still recognized as one of the best kids' electric scooters money can buy. It maintains speeds of up to 10 mph for as much as 80 minutes of continuous use. And as an added bonus, it's maintenance-free, so you won't need to worry about chain alignment! If you're looking for a scooter you can bring on a family vacation or that your kiddo can easily ride to school and stash in their locker, a collapsible model is probably best for you. 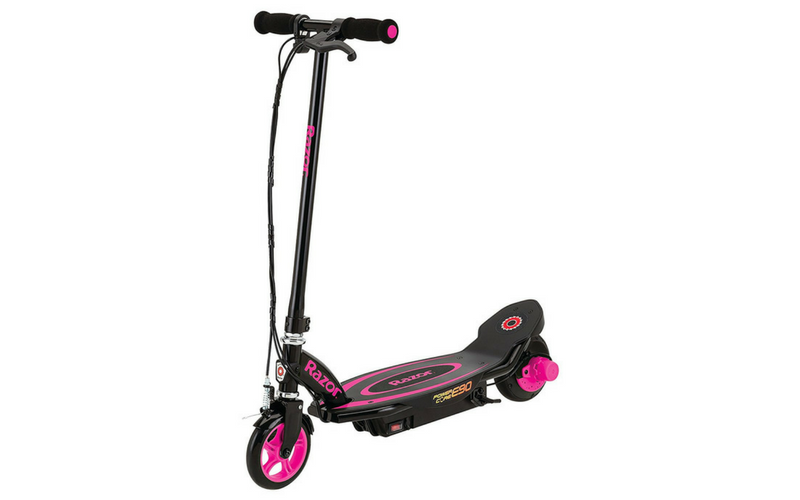 And our top recommendation is none other than the Razor A5 LUX Kick Scooter. It folds up easily, but just note that it's not rated for adults – so you might want to steer clear of taking this one for a test drive yourself. Good scooters don't come cheap, so it's always smart to try and find one on sale. We'll post all the latest deals on kids' scooters right here, so check back if there's a certain model you're waiting to grab on sale! Are scooters safe? Just like bikes, skateboards and other ride-on toys, there is an inherent risk that comes along with riding a scooter. However, there are a few things you can do to make things as safe as possible for your kids. Parachute Canada, a national organization dedicated to preventing injuries, recommends that EVERYONE wear a helmet while riding a scooter. A helmet that fits properly and is worn correctly can reduce your risk of serious head injuries by about 80% – so make sure your child wears either a bike helmet or an appropriate multi-sport helmet whenever they ride. They also strongly suggest that riders wear elbow and knee pads to protect from minor bumps, bruises and scrapes. Scooter riders should NOT wear wrist guards, since they can interfere with steering. If you have young riders, make sure they always have adult supervision when they're on their scooters. It's also a good idea to avoid busy roads, riding too close to the edge of a sidewalk or curb and cracks in pavement. What are your scooter recommendations? Let us know below!